As we all are aware of the Gutenberg release of the WordPress and because of it, you will face multiple challenges with your old WordPress website. The new version is going to provide you with multiple benefits. However, the marketers who have been using the old version for a long time will find it difficult to switch right away. It is necessary for the webmasters to manage Gutenberg changeover smoothly on the WordPress website. This version is named after Johannes Gutenberg, who was the inventor of the printing press over five centuries ago. 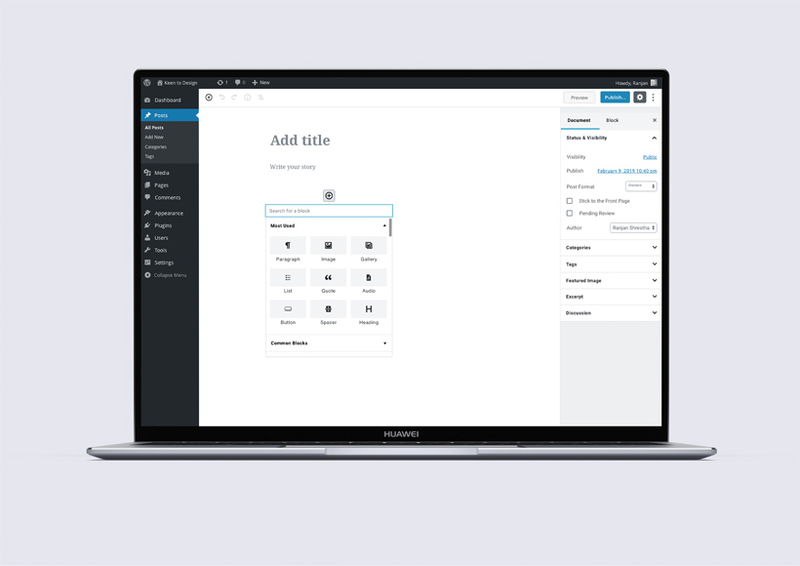 Apparently, this version of the WordPress interface is going to be more user-friendly and will help users to manage and create content in a better way. This interface is designed to be more intuitive and relying on more visuals and push-button tools than the old HTML coding. Gutenberg is going to be more like a modern publishing app that the webmasters and marketers can use to achieve more. Here, we will be discussing a few important and basic changes that you will face after the official release of Gutenberg. Let’s have a look at how you can manage the small and large changes. Before you go into the details, you must always focus on the basic changes of the interface. They have worked hard to make it more intuitive and easier for the authors to publish their work. Moreover, the addition of visual tools has made it a lot easier for the newbies to understand the platform. As it has become easier for new users to understand the WordPress in a better way, it has also become easier for integrating new features and functions. The current release of the interface is still under testing, and we won’t recommend you to install it just now because of the security loopholes and major changes. You must also know that you can end up losing your current content without warning if you immediately switch to the Gutenberg. Let’s have a look at how you can manage your WordPress website with Gutenberg. You should know that the Gutenberg is encouraging content creation and publishing. 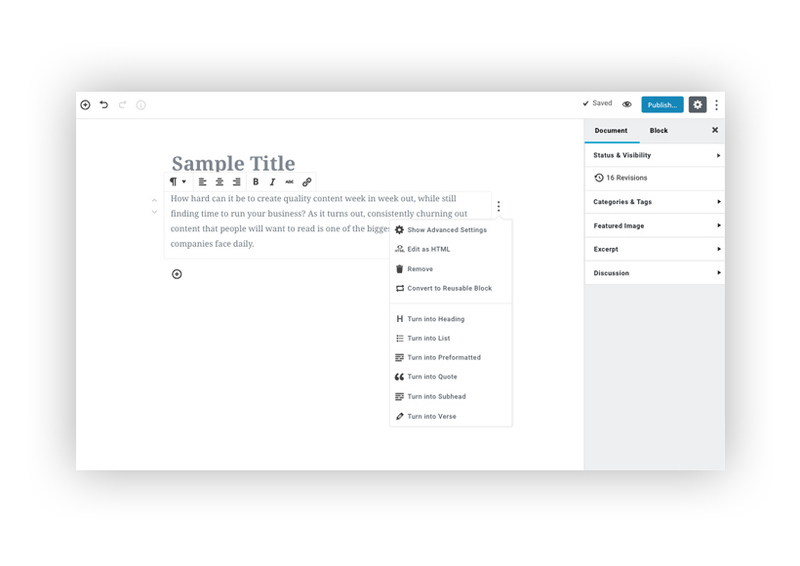 If you are a WordPress user and you have been using a classic editor, then the new interface is going to be your favourite one. It won’t take a lot of time for you to understand the basic features if you are a WordPress pro. However, the marketers would still like to use old versions because they are used to it. There will be a lot of changes that the content creators are going to like. You don’t have to create tables and visual texts offline anymore. You can click few buttons, and you can easily create tables and charts without going through any hassle after this new update. It is definitely going to be a better version for the content creators, and they don’t have to spend a lot of time formatting the content. We all know that the preparing the content before publishing can take a lot of time and for all those people who have been spending hours on the formatting, this release is going to save a lot of time. You can smoothly manage the changeover from the old side to Gutenberg. However, there can be real issues for the developers. What can be done for old custom websites? You should be certain about the fact that there are going to be integration problems if you are switching to the Gutenberg right away. As far as the old custom websites are concerned, then there can be some major issues with the new WordPress release. If you have integration with multiple third-party plugins and themes, then you will face some issues. We all know that with the major software upgrades, there comes the headache of dealing with the conflicts of codes, and other security problems. Even if there is extensive testing, you will face multiple issues if you have a custom WordPress website. The issues can be related to the plugins and themes. With such a significant update and new interface, you will face multiple integration issues, and the developers should start working on it right away. If you are not ready to switch to the new version, then you can keep the old version and stay with the custom built website because the old editor isn’t going to go anywhere. In order to stay safe for now, you can stay with the old version of your WordPress, and in the meanwhile, you can start working on how to make changes to your website for updating it to the newer version. If you like to stay with the old classic editor, then you can always install the Classic Editor Plugin. If you are not ready to switch to the Block Editor (Gutenberg), then you can always install this plugin, and by default, this plugin hides all functionality available in the new Block Editor. 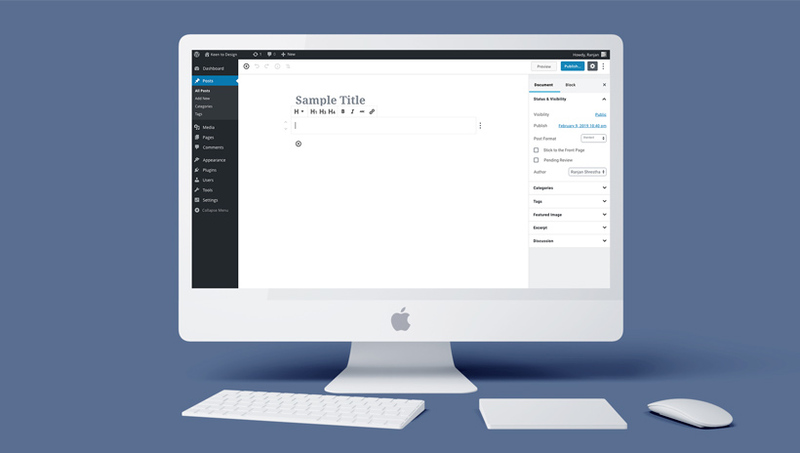 Classic Editor Plugin is an official WordPress plugin, and it will be fully supported and maintained until 2022. If you want to use the same old Classic Editor, then you can always install this plugin and maintain your website without any hassle. One of the most important things that you should be doing is going for a complete audit. A complete audit of your website is going to help you manage the new changes. If your web design and development team is facing issues with the new version, then it is time for you to audit the code and the design so you can stay up to date. It is one of the most important things that you will have to focus on so you can efficiently manage the changeover. A good WordPress development team should fasten the seatbelts and start working on managing the changes effectively. You can always monitor the transition and find a safe way to move your website to the new version without facing significant changes and problems. Yes, the Gutenberg is out, and it soon will be available to all the people who are using WordPress as a CMS. If you are ready for this change, then you will find multiple great things about this new interface. However, if you are concerned about the integration issues and finding it hard to switch, then you should know that the old version of the WordPress is still there and you can use the old visual editor as well. If you have any new piece of information about Gutenberg, then feel free to share with us.